Welcome to the New Wish List for 2016!! Some of you will remember that this is how they were done before. I've decided (with a little help) to try this way again. I will get this run until June, and in August will start up new ones again. Lists will only be 30 members long at a time. Once one is filled up, I will make up another "page". Why only 30 members at a time? Well, this will help you out when you are looking for a certain member. 2 pages is so much easier to look thru than 30 pages. Please note.... to join the wish list, you need to have at least 30 posts and be a member of Crochetville for at least 30 days. Please keep your wish list updated. You can list up to ten (10) items as usual. Once you've made up your list, PLEASE email me at Ladysorce at yahoo dot com, or shoot me a PM here. Your Email Address <---- Lot of you are forgetting this. Let's not forget to Thank our Fairy God Mothers (FGM) for the wonderful gifts they have just sent you. Please do NOT name them here. If you know who they are, please send them a PM AFTER you have thanked your FGM in the "Thank You" list. You do not have to have a wish list in order to grant a wish. But you do HAVE to send me a message with your info on it and let me know who's wish you are granting and what it is you are granting (just in case someone else has already granted it). P.S. even a postcard will make someone's day a little brighter. P.S.S. To all you wonderful FGM's, PLEASE remember to let us know what you are sending (even if it is thru email/ravelry). We need all of your info. This is so we can try to keep track of things. Thank you. Guess I am first again. 3. White baby or sports yarn that is not fuzzy. Maybe this Loops & Threads. 5. Anything made by my fellow crocheters. I have been waiting for this to start up again. Anyone wanting to get rid of there old crochet magazines would love to have some. Thank you and can't wait to read others wish list. I am so glad to see the new wish list out and already have seen a few I can answer. This is a great tradition and am so glad to see it continue at Crochetville!!! collecting stuff and donate sometime in November. It really is a year long project. Lots to Love 5” Baby Doll Holiday Outfits. St. Patrick’s Day, Easter, anything Patriotic, or something for Halloween. I use all kinds of buttons making my doll donations. I especially love decorative buttons that can be added to the outfits. I recently used some adorable umbrella ones on a raincoat, a flower one to decorate a hat, and some other pretty decorative ones to make outfits look more "dressed up." I would love any you can spare. 8. Crochet clothing for cabbage patch dolls 16"
1. Rosalie's birthday is March 31... She loves receiving mail, Birthday cards for her would be great! She will be 3! 3. I would love for people to allow me to send them some of my business cards & a couple samples of my favorite product! 7. 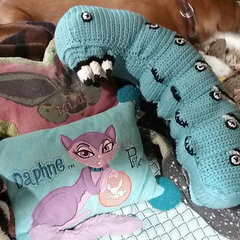 Anything made by a fellow crocheter! 9. Any of Nancy Liggins' afghan patterns (Non Personalized of course) - I have the Joined Wedding Rings one so far. 10. Your favorite Amigurumi patterns!!! 1. Any DK (double knitting), very light weight worsted, or sport weight/sock yarn. 2. Any little pouches/bags I can use for hooks, needles, odds and ends of small projects. Preferably natural colors or pastels, but will take any. 8. Any book/magazine with amigurumi patterns in it. 10. Anything else crafty, even if not yarn/crochet related. 3. anything made by you ! Oh this is so exciting! Please take note: I live in the Netherlands! 2. Any color yarn that you are done with and you are not using. I use the yarn for making pretty flowers. 3. Any crochet magazines that you are done with. 4. A pin cushion of any kind to stick my needles and pins in. 5. A card or post card with a few words from you on it. 6. Used packs of magnets. To go backs of my projects. 7. Any used color pencils. To color in my adult coloring books. 8. Anything made by you that is crochet. 10. A pattern for a crochet lamp. For a flashlight to work in.